Once upon a time a new community was built on the rolling hills just outside the northwest District of Columbia line in Maryland. The northwest part of D.C. had been built up in the early part of the twentieth century, while summer cottages began springing up on the gently rolling hillside along Conduit Road as people escaped D.C.’s brutal summer heat in cottages high above the Potomac River. 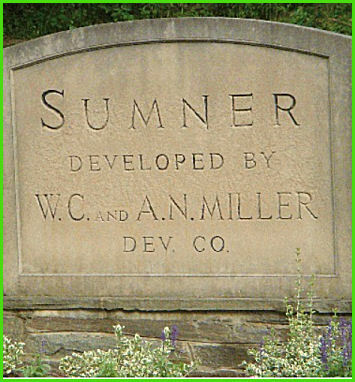 By the time Sumner’s development was commenced, the builders W.C. and A. N. Miller had gained a reputation for well-built spacious and handsome single family homes. Their earlier developments, Wesley Heights and Spring Valley, brought Sumner into the mix as buildable space in D.C. dwindled. In any of the three Miller Built communities life is really living. No other communities offer so much---social standing, beauty, location, neighbors you can really like, and all those intangible things which make for continued happiness of yourself and your family---all are yours in any of the thee Miller Prestige Communities. That May of 1948, “Leaves” heralded the opening of their newest community Sumner, noting that thirty years had passed since their first homes in Wesley Heights had been built, followed later by Spring Valley. “Leaves” featured Sumner’s pioneer family, Mr. and Mrs. John Kelso Shipe, who took up residence at 5601 Overlea Road. “Leaves” welcomed the Shipes and their cocker spaniel puppy, and speculated about the happy hours he would spend chasing rabbits in the woodlands adjacent to Sumner. Following the official opening of Sumner, homes continued to be built along Overlea Road and Ft. Sumner Drive. Once building commenced, “Leaves” would have a full page picture of their newest home, with a glowing description of its many amenities----under the heading of The House of the Month. It might seem quaint to us today to read of such amenities as “an electric disposall installed directly in the sink” or to see pictured a “new gas incinerator” which promised to end trash and garbage nuisance. But the homes were roomy, some using locally quarried stone, and carefully situated to preserve the trees that covered many of the sites. And above all, there were many variations in the exterior design and finishes so that there was never any “cookie-cutter” aspect in the Sumner community. In February of 1949, Sumner received high recognition among 65 new developments from the National Association of Home Builders, recognizing the builder of single family homes that exhibited fine community planning. The citation noted that Sumner represented “ingenuity, originality, and soundness of design, construction, and suitability of the project to its location. “ Among the judges was Major General Ulysses S. Grant III, chairman of the committee. The 60 acres comprising Sumner was just in the beginning phases of its development, but had already received high praise. That same month the “Leaves” House of the Month was at 5619 Overlea Road. Four years later “Leaves” published a photo from January 1953 of the newly organized Sumner Citizens Association. Its board of directors was comprised of eleven men and one woman. Again, we today might find something quaint in that edition of “Leaves” in the following note that 4 boys had destroyed the first Sumner community Christmas tree by removing all its lights except ten bulbs at the top of the tree that they could not reach. There was no mention of the punishment that might have been meted out. The early officers of the Sumner Citizens Association were mainly worthy and successful men----generals, admirals, the Honorable, etc., and not until 1973 was the first woman elected president of the SCA. At the founding of the SCA in September, 1952 100% of the Sumner community joined to better focus on issues of community concern, such as traffic and community lighting. As the development of Sumner continued, homes were constructed along Ft. Sumner Drive, further on Overlea Road and on Brookeway Drive. A house at 4905 Brookeway was featuted in “Leaves” as the House of the Month in April of 1949. It was later in 1953 that the first house was built on Madawaska Road. And “Leaves” had a promotional statement for the development starting on Madawaske as it was specifically intended to attract “young adults who grew up in Spring Valley and Wesley Heights and wanted the amenities that they grew up with.” That development recognized the “financial limitation” of young families building continued along Marlyn Drive, Cleves Lane, and Madawaska Road. You may wonder what the cost of living in Sumner was, at the beginning of its development. The asking price for “small” Sumner homes began at $22, 750, and ranged up to $41, 750 for “larger” homes. Before development began on Nahant Street, in 1954 the land was described as mostly woodland, but the builders saved as many of the existing trees as possible. In January of 1954 the House of the Month, at 5004 Nahant Street was noted for the size of its kitchen 15 X 9. That same year, another article appeared in “Leaves” that gives a taste of Sumner’s early days as a community of young families. The Sumner bus (which many early Sumner residents remember as the developer’s invention to bring people to this location, and take residents to the bus terminal at Chevy Chase circle) took the art students of a teacher living on Brookeway Drive---children ages 9 thru 13---- for a day of sketching at Pierce Mill in D.C. Anyone with an urge to read more about Sumner’s early days can visit the library at American University where the collection of “Leaves Magazine” is located. “Leaves” was published from 1920 to 2007, first in monthly editions and later quarterly. It covered items of interest to the three Miller built communities of Wesley Heights, Spring Valley and Sumner-----such as notable residents, weddings, graduations, cultural events, and of course advertising from local businesses. The old advertisements alone are worth the trip to the library, in case you think that nothing much has changed in the past fifty years. And, of course, many of us will find the house where we live pictured as a long ago House of the Month. With thanks to Frances Miller Seay, whose grandfather was A.N. Miller. She steered me to the “Leaves” collection at A.U.